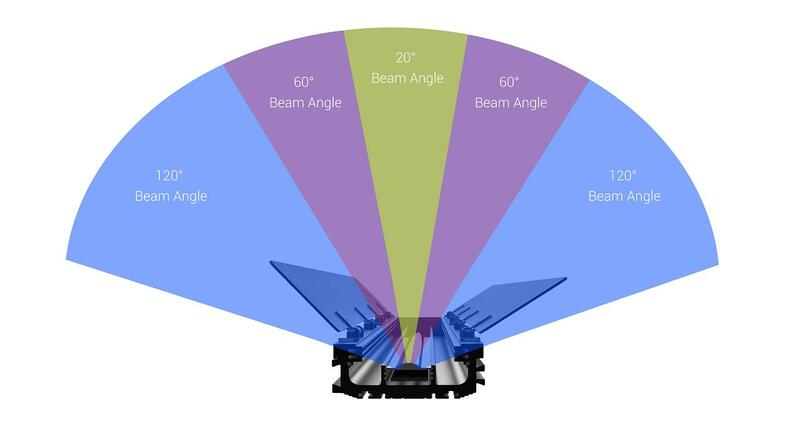 "This light is perfect for anyone who's been hesitating to make the move to LED's from your traditional hot lights, or videographers and photographers that prefer high end fluorescent fixtures, because it's the most flexible light on the market, essentially performing as a standard Fresnel, Fluorescent Panel, Cyc Light, SoftPanel, and LED Panel all in one light" FloLight's BladeLight is a Professional Video and Photography Open Faced COB (Chip on Board) LED Light, that outperforms standard Panel LED, and SoftPanel LED Lights with it's Linear LED Form Factor, Incredibly High CRI Rating of 96, Focusable Beam angle from 120° Flood Light to a 20° Spot light, with incredible LUX Output of 13,000 (avg) at 1 meter (Around 3 Feet). Trusted by Professionals around the world the BladeLight uses LEE's Zircon 810 Diffusion to create an incredible Soft wrap around Light equivalent of high end Fluorescent lighting but with better color rendition and output to footprint. DayLight versions include Zircon 806, and 809 precut Amber warming filters for incredible flexibility of color temperature. We are also proud to annouce we are accepting Pre-Orders on Bi-Color BladeLights* that will include V-Mount or Anton Bauer mount battery mounting options. The BladeLights unique length in 36" and 18" versions allows the BladeLight to act like a Longer tube fluorescent lighting solution. Placing diffusion on the Barndoors, or Silks in front of the BladeLight create a much stronger Soft Panel LED lighting solution.Unlike standard Softpanel LED Lighting solutions, the BladeLight is also flexible to offer incredible sharp cuts, by shaping the light with the included barn doors. Standard LED Panels have slotted shadows (Muliple shadows) when you cut the light with their attached Barndoors or Flags. Soft Panel LED's simply cannot have an effective cut, because of the nature of diffused light.The BladeLight unique patent-pending linear design offers beautiful wrap-around light when positioned horizontally and infinite shadow control when turned towards a vertical orientation.QUALITY LEDS The BladeLight is available in Daylight, Tungsten, Bicolor*(Coming Soon) and Green versions for use with green screens. With the green LED version you can light a green screen 10 feet wide by 10 feet high with just two lights. 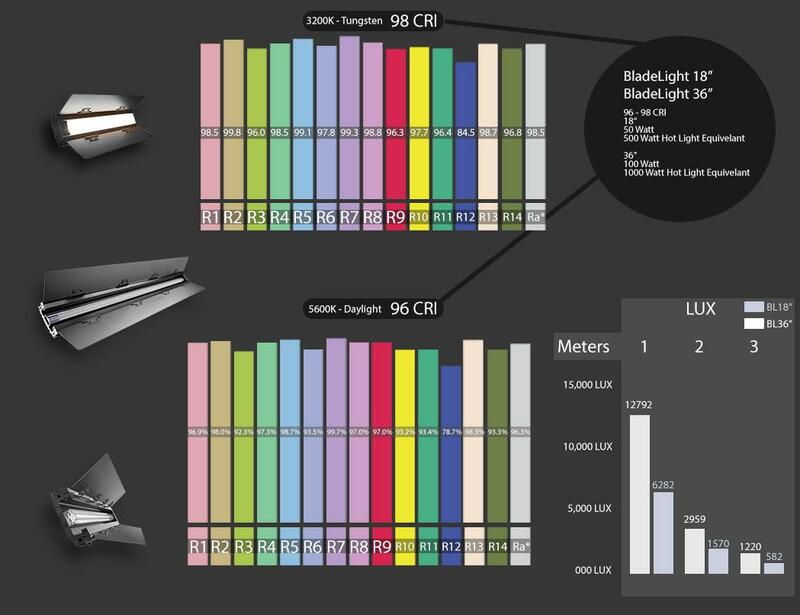 The Daylight/Tungsten LEDs offer 95+ CRI with high R9 and R12 values for perfect skin tones. Includes LEE Zircon Diffusion 810 in all models (Precut to fit in Channels)Includes for 5600k Daylight Models, Zircon 809, 806 warming and Tungsten/Amber correction gels. - High power up to 100w! - BladeLight LED Strips Available in Daylight, Tungsten, and Green for use with a GreenScreen. Bi-Color coming soon. - Incredibly durable Light Body - (all of the sensitive technology has been taken out of the light fixture, making the BladeLight incredibly durable).